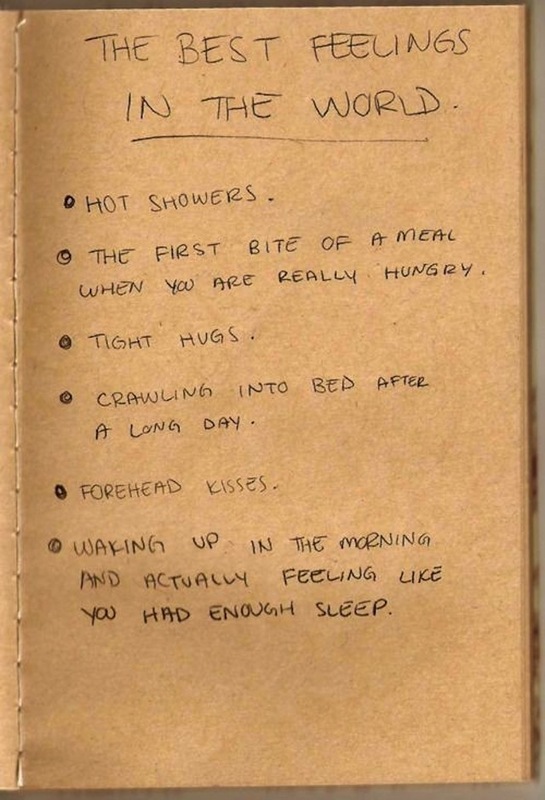 I wholeheartedly agree that the six things above are some of the best feelings in the world, but wanted to add to the list, and would love if you did, too. Slipping into bed when you've just changed the sheets. Wet kisses from your excited dog who hasn't seen you all day. Putting on a brand new white t-shirt for the first time. The last few strides of a particularly long run. I could not agree more... with every one of these! Coming home after a long day at work; snuggling with the husband; waking up on Saturday and Sunday morning. the last one is super hard to come by for me... great weekday inspiration! #6. I've come to value waking up and feeling refreshed. Makes such a huge impact on your day! YES hot showers and waking up actually feeling refreshed are the most amazing feelings! Awww I love this. I'd have to add cuddling up with a book, a fire, and some hot chocolate while being snowed in. Yea...I'm ready for fall, and obviously winter too! Taking off your bra!! :) Excited dog kisses are my favorite!! A deep breath of quiet, cool air really early in the morning! freshly brewed coffee on a crispy winter/fall morning!!! in sweats of course!!! !